Whenever a new version of an Android firmware gets released, the folks over at XDA are usually the first to “extract” some of the more interesting apps. You might remember that shortly after LG introduced its 5.5-inch G3, they ported the so-called Smart Keyboard of the device for all Android devices that were running Android KitKat. Even some of Galaxy S5's apps were released on XDA a whole month before Samsung's flagship got launched. And now, just two days after Google demonstrated Android L, XDA has once again come into play. The developer preview of Android L has already been released for select devices, but, alas, only a small percentage of Android users will be able to tinker with it yet. 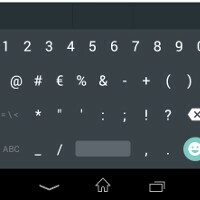 Fortunately, the rest can also experience the new Material Design to some extent by flashing the Android L keyboard on their devices, courtesy of XDA. Still, there are certain prerequisites – you'll need a rooted device that is running Android 4.4 KitKat or higher with a custom recovery on board (either ClockworkMod or TWRP will do the trick). You'll also need to uninstall your stock Google Keyboard. If these conditions have been met, you can simply flash the Android L keyboard via the custom recovery. In order to get the Material Design look, you should head into the settings menu of the newly-installed keyboard and change the color scheme. The app has been successfully tested on some of the more popular Android devices, most notably the Nexus line, the Galaxy S III, S4, S5, the HTC One (M8), the LG G2, so if you are sporting one of these, you shouldn't have any issues. Of course, you'll need to strictly follow the instructions - these, along with the Android L keyboard itself, can be found at the source link below. The new Android L wallpapers and its boot animation have also been extracted - once again, thanks to the XDA folks. Is this a different keyboard from the one on the Play Store? How's this different from stock Google keyboard with a different skin? Any added functionality? I understand that B&W emoji is easier to read on a keyboard under unfavorable light conditions, but I hope that the colorful icons are still displayed as before. Gives FC on N900 stock & rooted rom. I like my Swiftkey, so I think I'll pass.